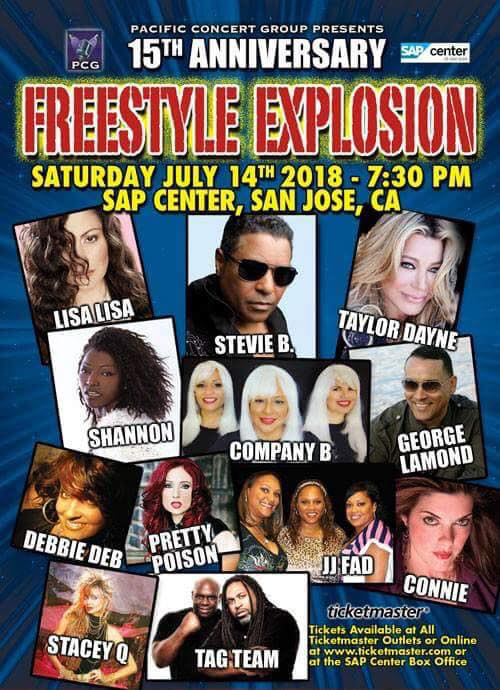 Freestyle Explosion July 14th 2018 San Jose, California. Join us this Saturday as we bring you the Superstars of the Freestyle era in one venue. Freestyle Explosion, Saturday, July 14, 2018. 7:30 pm, SAP Center, San Jose, California. Featuring: Connie, Lisa Lisa, Stevie B., Taylor Dayne, Company B, Shannon, George Lamond, Pretty Poison, Debbie Deb, Tag Team, Stacey Q and JJ Fad. Tickets available at all Ticketmaster outlets or at the SAP Box Office.